This paper aims to add to the understanding of factors impacting how raw materials should be managed in iron and steelmaking firms, and explore capabilities underpinning proficient Raw Materials Management (RMM). Process firms manipulate material properties to develop and produce upgraded raw materials for subsequent use in upstream product and application areas (Barnett and Clark 1996). Thus, process firms manufacture non-assembled products through processes in which raw materials are transformed in continuous flows or batches (Lager et al. 2013). Firms in the iron and steelmaking industries are key examples of such raw material intensive firms, in which the firms’ capability to manage their raw materials constitute a critical dimension of their competitiveness. The basic units of “raw materials management” can be said to be all the activities—acquiring, purchasing, refining, developing raw materials—that go into delivering a sufficient amount of raw materials at an acceptable quality and price to ensure that the strategic and operational objectives of the firm are achieved, while also working proactively within the organization to assure that available raw materials provide the best possible benefits within the limitations given by the production process. Effective raw materials management means performing all these activities better—i.e., faster, with higher quality, better price, and with fewer inputs and less hurdles—than competitors. All this needs to be done taking into consideration both the competitive environment of the firm as well as internal strengths and weaknesses of the firm, i.e., the cost of using any raw material is linked to the processes used within the company and cannot be understood unless a broad view is applied. Many firms, however, still deploy a rather basic approach to RMM: an approach that is reactive and short-term (Slowinski et al. 2013). It should be noted that not all iron and steelmaking firms are in need of a broad approach to RMM. Certain details of when a holistic approach to RMM is necessary in relation to raw materials supply can however be deduced from the way raw materials are traded. If the raw material in question is a publicly traded raw material on a recognized exchange with a multitude of suppliers, like for example refined copper on the London Metal Exchange (LME), there may be less of a need for a complex use of RMM approach. That said, many firms use a portfolio of different metals and materials, and for other raw materials where the quantities are smaller, the suppliers fewer, and when individual companies might have a direct market impact, a more elaborate RMM can make a difference. Other metals could carry costs as the user of the metal gets associated with problematic environmental and social practices by the miner. Cobalt is one example of a metal where non-economic costs are potentially high, as production is often linked to problematic geographical areas like the Congo. Most metals traded on an exchange are generic in the sense that, e.g., the refined copper sold is more or less exactly the same product no matter who produced it. This reduces the need for a more holistic RMM. However, iron ore is a raw material with quality properties depending on the choice of supplier, which limits the number of potential suppliers for companies like Höganäs and other steel companies with complex and high-quality downstream products. Thus, the need for specific iron ores does give rise to a need for a well thought through RMM. Practically, this strategy could include long-term contracts and strong mutual ties to the suppliers, joint and research. Hence, in some cases, iron and steelmaking firms have a lot to gain from developing a broader approach to RMM. Firms that deploy a basic, reactive, and short-term approach to RMM fail to look beyond the functional elements of RMM, such as the purchase or procurement of raw materials or technical issues related to process development and material properties. 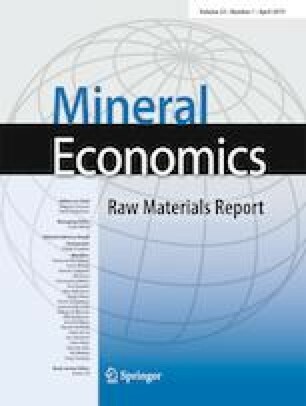 Although these dimensions are clearly of utmost importance, we argue that the prevailing short-term, reactive, and functional/operational approach to raw materials that many iron and steel firms adopt is sub-optimal as it increases risks in several layers, such as price risks, supply risk, and production risks. There are multiple reasons for this claim. First, the way a firm manages raw materials greatly affects both short-term profits and long-term business opportunities. For example, from a short-term perspective, when the supply of raw materials is smooth, production volumes can be sustained. When that supply is interrupted, however, the impact on firms is immediate and severe. Second, from a long-term perspective, the prices of raw materials affect long-range average costs, marginal costs, and profitability (Aylen and Albertson 2006), and the quality of raw materials affects both prices and the value proposition to customers. Therefore, raw materials management is a complex task that goes far beyond procurement or pure technical issues in manufacturing process development (Florén et al. 2013). The need for change is further stressed by the transition from a relatively stable price discovery mechanism for iron ore, the so-called benchmark model, which has been abandoned and replaced with a more market-based mechanism, giving rise to more short-term volatility (UNCTAD 2012). Most iron ore remains traded under long-term contracts with defined volumes, qualities, and prices. Iron ore prices used to be agreed upon in annual negotiations but are nowadays usually set on a shorter term basis, mostly quarterly and monthly but increasingly even shorter periods are used, weekly, and daily. Previous research has contributed significantly to understanding how firms should deal with the challenges related to raw materials. More specifically, research has contributed knowledge on handling raw materials to mitigate supply risks (Achet and Helbig 2013; Rosenau-Tornow et al. 2009), on forecasting supply trends for specific types of raw materials (Massari and Ruberti 2013; Humphreys 2013), on policy making at the national level (Tiess 2010; Noras 2016), and about how firms can deal with shortages of important materials (Slowinski et al. 2013). The understanding of raw materials management from a holistic perspective is, however, largely lacking, and extant research does not provide qualified advice to firms on this matter. This study aims to provide such knowledge by drawing on insights from Höganäs AB (hereafter Höganäs), a world leader in ferrous powder metallurgy, and their efforts to identify aspects and principles of raw material management. More specifically, the purpose of this paper is to provide a holistic view on how iron and steelmaking firms can manage raw materials. Our elaboration of a more holistic view on RMM builds on two elements. First, we depict five external uncertainties and three internal conditions that impact firm-level raw materials management. Second, we present six critical capabilities that underpin proficient firm-level raw materials management in iron and steelmaking firms. Prior research into raw materials management is nascent. We therefore relied on an interpretative case study as the research strategy (Edmondson and McManus 2007). The case study was guided by prior research related to raw materials management (e.g., Slowinski et al. 2013; Jin et al. 2016; Lapko et al. 2016) which served as conceptual inspiration, but we maintained a considerable degree of openness to the data, i.e., letting themes and codes emerge from the data analysis (Walsham 1995). We draw on a case study of Höganäs, the world leader in powder metallurgy. The company which was originally established in 1797 today operates in 15 countries, has 13 production centers globally, and employs about 1880 employees. The headquarters is located on the Swedish west coast in the town of Höganäs, where the company was also established. Höganäs has more than 2500 customers in more than 75 countries, and the company produces more than 1500 products, many of them tailor-made for specific customers. There are many application areas for metal powders including sintered components, soft magnetic composites, and surface coatings and also 3D printing. These powders are used in end-products as diverse as automobiles, heat exchangers, home appliances, wind power stations, and breakfast cereals. The company uses high-quality magnetite iron ores and reduces it through the proprietary Höganäs sponge iron process where a finely divided iron ore is being reduced with coke breeze yielding a spongy mass of solid iron which can be readily milled to iron powder. This iron powder is later mixed with other additives/metals for a final product dependent on the demand of the individual customers. For more information about the company, please visit http://www.hoganas.com. Höganäs is appropriate for this study as it has made deliberate efforts and worked systematically over many years to address different aspects of raw materials management. Empirically, the present study draws on three sources of data: interviews, workshops, and meetings/group discussions. Fifteen individual interviews were conducted with respondents who represented different functions within the firm (including corporate finance, supply chain management, purchasing, production, technical support, and research and development [R&D]), as well as the former chairman of the board. The aim of these interviews was to (1) gain an in-depth understanding of how raw materials issues were handled within different departments, functions, and the firm as a whole; (2) to delineate the key dimensions of strategic raw materials management; and (3) to understand subsequent performance implications. The results of the interviews were used as input for workshop discussions, where the findings were elaborated. The workshops focused on discussing the effects of raw materials, how a firm could handle raw materials challenges, long-term issues in managing raw materials, and critical capabilities. Informal conversations and observations supplemented the formal data collection. Ten meetings/group discussions over a period of 3 years were then used to validate the results, including field visits to production sites in Höganäs (Sweden) and Shanghai (China). Data were analyzed by means of thematic analysis (Braun and Clark 2006). The analysis was iterative and implied moving back and forth among data, literature, and emergent version of codes, themes, and analysis. Our data analysis unfolded over five phases. First, we familiarized ourselves with the data, i.e., carefully reading interview transcripts and notes from workshops and meetings to know the materials in depth. This improved the contextual understanding of raw materials management and lead to ideas for codes and themes. Second, we generated initial codes. Data was coded and recoded several times, taken into account both prior literature as a guide and the empirical insights as such. When having generated initial codes, we started searching for overarching themes by grouping similar codes together. Here, external uncertainties and internal conditions emerged from the interviews as the two major themes (with the sub dimensions mentioned in chapter four as codes). The organizational capabilities in chapter five was a third overarching theme, which came mainly out of the workshops and meetings/group discussions data. We then reviewed these themes and codes by checking that data for each code was supportive, and then analyzed whether the thematic map (codes and themes) reflected the meanings in the full set of data. We then finalized the data analysis by writing a draft version of this paper, which were circulated and discussed with the case firm at subsequent workshops and meetings. Before describing external uncertainties and internal conditions impacting raw materials management in iron and steelmaking firms, we will begin with making the case of a holistic approach to RMM. More specifically, in the following section, we will describe how raw materials decisions impact three key aspects of firm performance. First, the way firms manage raw materials affects operational performance, that is, delivering necessary product quality at the lowest possible operation cost. Secondly, how raw materials are dealt with also affects market performance, as raw materials will impact the extent to which customer needs are fulfilled. Thirdly, by extension, raw materials management largely affect financial performance and firm profits. Raw materials greatly affect the performance of the overall manufacturing process. If raw material quality fluctuates, the firm needs to tune its production process continuously to assure product properties are not affected. Thus, if not managed proficiently, raw materials will impact production costs and product quality. Another key aspect is the environmental impact of operational performance. Some raw materials have a greater impact on the environment than others, which is important to consider when making choices related to RMM. Choice of raw materials also affects the firm’s ability to satisfy customer needs, because raw materials (along with manufacturing processes) define product properties. Consequently, to make appropriate decisions concerning raw materials greatly affects the firm’s overall market performance. In the case of Höganäs, one example is the additives (alloying elements) that are used to give the metal powder its properties. These additives, to a great extent, affect the quality of the products Höganäs’ customers produce, including speed of production and potential pollution levels. Raw materials management greatly influence financial performance. In the most basic case, buying a raw material at a lower cost directly affects the profit margins of products sold. However, higher prices for some raw materials may sometimes offset lower prices for a lower quality of the same raw material, because of lower production disturbances, lower production costs through for example a lower energy use, and the potential to charge higher prices for products of higher quality delivered. Financial performance also has a risk management component, as iron and steelmaking firms typically want to transfer the price volatility upward in the supply chain. Managing raw materials should therefore allow the firm to deal with financial risk exposure, both through their business model design and using financial instruments that allow the firm to reduce financial risks connected with raw materials. The introduction of market-based iron ore prices and coke prices has forced the steel industry to adapt to changed market realities, which did not exist under the benchmark pricing model, such as increased price volatility and higher transaction costs. And yet, the introduction of a market-based price and related trading platforms has also meant that firms can use financial markets to hedge their raw material prices and hence lower risks. This was not possible nor necessary in many cases under the benchmark pricing regime. Against this backdrop, we argue that iron and steelmaking firms has much to gain from developing a holistic approach to raw materials management. We now turn to describing the external uncertainties and internal conditions that need to be analyzed if firms are to increase their RMM proficiency. Raw Materials Management that goes beyond a basic approach requires an in-depth understanding of impacting/influencing factors. These factors fall into two categories: external uncertainties (issues largely beyond the influence of any individual firm, although they require firm-level attention and adaptation) and internal conditions (issues under direct influence of firms related to the strategic and operational orientation of the firm). In the presentation of these factors, we will use Höganäs and their situation as an example. The political and regulatory context of many raw materials have made them a strategic issue. For example, national policies and regulations can have a direct impact on the availability of raw materials, and trade barriers may delimit the options of supply and increase sourcing costs. The Dodd–Frank Wall Street Reform and Consumer Protection Act, for example, directly affected the supply of cobalt from the Democratic Republic of Congo, which was and still is one of the world’s largest exporters of cobalt. Another example is the Chinese export restrictions on rare earths which limited global supply of these metals. Furthermore, environmental regulations dictate which handling processes and waste treatment procedures that must be used for different kinds of materials, and producers must comply with standards set by authorities. This is particularly important for trade in scrap or waste materials. Over time, there has been a gradual transfer of mining further away from the markets for the final products of companies such as steel companies, which increases the risks of these companies (ICMM 2013). Geo-political changes also raise concerns for political and social risks. For example, although China has plentiful suppliers of raw materials, many firms are cautious when dealing with Chinese suppliers. In 2011, China limited the export quota of rare earth metals, which greatly impacted the global wind turbine industry (Ericsson 2015). Another example of political risk is the great strike in 2009 at Vale-Inco, which lasted for several months and created great difficulties for industries that use nickel powder as a raw material. The second uncertainty is related to the bargaining power of the suppliers of raw materials. Over time, iron and steelmaking firms must endeavor to understand the change in bargaining power of suppliers of iron ore. Raw materials suppliers in particular iron ore miners are often multinational companies that supply their products to a number of customers. The corporate concentration for iron ore mining is much higher than that for steel production (UNCTAD 2016, p. 42). The iron ore miners in general have more bargaining power than the often smaller steel companies, which defines their relationship with their suppliers the iron ore miners. In this context, a steel manufacturer of highly specialized products of relatively small volumes in a global perspective (such as Höganäs) often is a small actor vis-à-vis its suppliers. The corporate concentration in the iron ore mining sector, for example, has been increasing over the past 25 years with the Herfindahl-Hirschman Index in 2014 for seaborne iron ore trade reaching 1235, which indicates a moderately concentrated marketplace (UNCTAD 2016). According to this source, the corporate concentration is set to increase in the coming years. This reduces the bargaining power of steel companies in the buyer–supplier relationship. This problem is further reinforced when quality demands are high, as for example when raw materials are refined to fit specific and demanding customer needs, thus further delimiting alternative sources of supply. Höganäs, with its particularly high-quality demands is in a vulnerable position in the supply chain. This clearly shows the importance of tracking and forecasting the change in bargaining power of raw materials suppliers, as it will impact the situation of the focal firm. The third external uncertainty is related to changes in the supply and quality of important raw materials. The supply and quality of raw materials are not static and may change dramatically over time. For example, currently, China produces more than 95% of the world’s rare earth metals (Ericsson 2015) and well above 80% of tungsten and magnesium (USGS 2013a, b). Because of the risk for monopoly prices, such supply concentration should clearly impact long-term planning for buying firms. Furthermore, the volatility of metal prices is increasing, including many raw materials used by the steel industry. For example, iron ore prices increased by roughly 100% from early 2011 to early 2012 only to fall back dramatically in 2013, 2014, and 2015 (Löf and Ericsson 2017). When the price for a certain raw material drops to a level at which producers cannot make a profit, some producers may disappear or withhold production capacity, which has been the case in the iron ore mining sector. For Höganäs, the emerging local Swedish iron ore miner Northland might have become a supplement to its traditional iron ore supplier, but Northland went bankrupt in 2014 (Wilson and Stammler 2016). Even when the iron ore prices fell in the mid-2010s after a few years of very high levels, such periods clearly underline the importance for firms whose operations rely heavily on a specific raw material to have a knowledgeable and efficient RMM in place. Another example is the recent changes in the markets for new scrap metal, a raw material Höganäs uses to produce metal powder. In brief, new scrap metal prices have sky rocketed as supply has decreased, along with increasingly problematic contamination levels in old scrap. Historically, Höganäs has relied heavily on scrap metal from the automotive industry. However, car manufacturers use more alloyed steel (for example with manganese) in lightweight bodies, than they have done historically which poses a problem to Höganäs. Furthermore, with changing demand patterns for example for vehicles, scrap availability is changing (Rombach et al. 2012). This clearly affects production of any industries which rely on scrap for its production. Höganäs is but one example of companies, which must adapt firm-internal production processes and process technologies. The fourth external uncertainty is related to how customers’ preferences change over time. The product properties that customers demand will demarcate the options the firm has concerning its choice of input raw materials. For example, for Höganäs, the changing demands by its customers have over time pushed Höganäs to manufacture products with better quality which have necessitated the use of purer and purer raw materials. This affects the options Höganäs and other firms producing high-quality steels, such as for example the Nordic speciality steel producer SSAB, have regarding which iron raw materials that can be used, and—perhaps more importantly—which suppliers to use. Thus, changes downstream in the value chain in the form of changing customer needs risk having a dramatic impact on the sourcing options available to iron and steelmaking firms. Such changes, and the related uncertainties, need to be surveyed and forecasted as to avoid negative consequences from a raw materials management point of view. As new knowledge becomes available, old constraints may be resolved and new opportunities explored. This constitutes the fifth external uncertainty. New knowledge may originate in the firm’s own R&D department, but also in the value network or ecosystem in which the firm is embedded, or at universities or research institutes. For the steel industry, there are examples on a national level. PRISMA (Centre for Process Integration in Metallurgy) is such an example that is operated by the Swedish Metallurgical Research Centre, Swerea MEFOS (Lager et al. 2013). Another example at the European level is the ULCOS1 (Ultra Low Carbon Dioxide Steel Manufacturing), which is comprised of 48 European partners. Advances within such initiatives will contribute to new knowledge and novel technologies that could affect the way firms deal with raw materials, both operationally and strategically. It is therefore important for iron and steelmaking firms to continuously survey how research advances relevant to their business can be exploited. The first internal condition related to raw materials management concerns internal product development. As noted above, product specifications, as defined by customer needs, will clearly impact the choices firms make regarding what raw materials to use. But product specifications are in some cases also set internally, partly based on other criteria than those the market requires. Historically, this has been the case at Höganäs, due to the ambition to constantly exceed customer requirements. Such product specifications decided internally by a producing firm will have a direct and significant impact on the options for raw materials supply. Tight specifications and high-quality standards will narrow the available options of which raw materials to use. When product specifications are tight, demand for high-quality raw materials increase and the number of possible suppliers decrease. In addition, when a firm develops new products, the raw materials issue will be critical to consider thoroughly, as design choices need to recognize the constraints of raw materials. For example, in cases where a product property can be achieved using alternative raw materials, the material with the better sourcing situation should be used (all else being equal). Hence, the way a firm deal with product development is clearly a part of raw materials management. The production or process technologies a firm deploys are a second critical internal condition. These technologies determine how flexible the firm can be regarding which raw materials to use. Some manufacturing technologies are more flexible than others and may allow a firm to use different types of raw materials with varying prices and qualities (without reducing product qualities). This, too, affects the list of possible suppliers. For example, Höganäs’ use of scrap as a raw material in metal powder production can be attributed to their flexibility in manufacturing technologies. Over time, an efficient manufacturing process has been created that allows the firm to produce high-quality metal powder from a range of iron containing raw materials such as pig iron, DRI, HBI, and various iron ores. Changes in the chemical composition of each of these can also be managed effectively. Recognizing the impact of manufacturing process technology design is therefore an important element of raw materials management. Lastly, the cost structure of the firm is an important internal condition that needs to be considered. Manufacturing firms must recognize that the purchasing cost of raw materials is only one dimension (albeit an important one) of the total cost of raw materials. Even if a specific raw material might be expensive to purchase, it can, in fact, lead to lower total production costs. One example was Höganäs’ decision to use HBI/DRI and mix it with less pure and less expensive scrap metal to reduce production costs. Scrap with more impurities is less expensive to buy than high-quality more pure scrap. However, the costs associated with the necessary processing efforts needed to deal with these impurities (e.g., removing sulfur and phosphorus) might easily be higher than the higher price for high-quality scrap. Also, the cost of raw materials cannot be looked at without including costs of transport, packaging, and handling all additional costs which might greatly affect the total cost of using a particular raw material. Another example is Avesta Sheffield (Outokumpu Oyj 2013) that managed to use scrap from alloyed steel instead of ferroalloys as a source of the alloying elements wanted in steel. Furthermore, the company uses scrap and other sources of iron instead of producing to pig iron, to produce stainless steel. It managed to do this at a lower cost than its competitors. In sum, it is critical to consider the full cost structure of the firm when deciding on which raw materials to use. So far, we have described external uncertainties and internal conditions related to raw materials management. Mapping these, will help firms to understand the need of a holistic approach to raw materials management, based on a thoroughly analysis of the external environment as well as of internal conditions. But what will it take for iron and steelmaking firms to increase their proficiency in better managing raw materials? In the following, we will describe six capabilities that together constitute a basis for a holistic approach to RMM. A fundamental element in a holistic approach to raw materials management is to analyze global development and trends, including tracking geo-political risks and systematically collecting relevant data about the raw materials used and their suppliers. As policies and regulations (such as environmental regulations and trade barriers) often have direct effects on the availability and prices of raw materials, firms need to follow the political and regulatory context influencing raw material supply. Furthermore, a holistic view also includes following and forecasting changes in industry structure and dynamics. Firms should thus ensure that they map and track changes in the industry, including mergers and acquisitions among suppliers, their bargaining power, as well as competitors, so that they can act on their sourcing situation in an effective manner. Therefore, firms need to have a capability to continuously collect information regarding the external factors that exert influence on their operations. The overall aim should be to develop strategic flexibility that allows the firm to adapt to changes in the business environment without incurring large costs or losing competitive advantage. Iron and steelmaking firms need to develop their operational flexibility, because a certain manufacturing process or choice of process, to a large extent, determines which raw materials that can be used. This is critical when new plants are designed but applies also to existing factories. For example, the Höganäs Halmstad plant made significant investments to solve handling problems and automation requirements for HBI in the first step of the production process, that is, a new furnace feeding process. This illustrates that modifications to existing process technology and process optimization might be a way to increase operational flexibility without changing the entire manufacturing process. Furthermore, firms can also introduce substitutes for raw materials. This is, however, only possible with a flexible manufacturing process. For example, scrap metal has long been considered an ideal raw material, but higher costs and increasingly alloyed materials in the scrap have forced Höganäs to look for other options, including virgin materials such as HBI or DRI. Developing a supply flexibility is the second capability underpinning proficient RMM. This may imply searching for additional suppliers of raw materials, particularly single-sourced items. It can also involve developing closer relations with its key suppliers. Long-term relations have been particularly important in highly capital-intensive iron ore and steel industries. The necessary expansion of the Australian iron ore mining capacity in the 1960s would not have been possible without the long-term off take agreements with Japanese steelworks. On the other hand, their expansion would not have been possible without a secure and stable iron ore price, which the benchmark system guaranteed at that time. Another example, during the long strike at Vale-Inco in 2009, Höganäs experienced problems in its supply of nickel raw materials when deliveries from Vale-Inco were stopped. Höganäs was forced to look for alternative sources of supply and started to use a Russian producer of nickel powder. This solved the immediate supply problems, in spite of initial teething issues when starting to cooperate with a completely new partner. At the same time, it reduced risks for the future by being single-sourced. With this Russian supplier, it was possible for Höganäs to overcome the consequences from the Vale-Inco strike. The problems in this case could have been exacerbated as the volumes of a certain raw material that Höganäs purchases is small, making sales volume less attractive for an alternate supplier, but luckily the new supplier could deliver what Höganäs demanded. Under these circumstances, building stronger relationships, including also actually buying from more than one of them, with several competing suppliers is of great importance even if it could mean a slightly higher cost than when having just one supplier. One way to do so may be to actively involve critical suppliers in joint development and provide them with technical feedback as to support their development. This is done in the mining industry where some of the major iron ore companies have established development cooperation with specific equipment suppliers (Anonymous 2018). The fourth capability supporting RMM in iron and steelmaking firms is about assuring internal coordination among relevant functions and departments within the firm. The supply of raw materials is not a sole concern for the purchasing department, although it plays a key role. It is important to involve the supply department in other functions of the firm and vice versa—especially R&D and production—to assure that information about supply challenges are diffused within the firm. For example, information about material shortages is often provided too late, resulting in negative performance effects. It is important, therefore, that firms sustain appropriate communication channels (such as liaison officers and development teams) that connects functions such as purchasing, R&D, and marketing with a flow of information regarding key raw materials. Specifically, it is also important that development engineers have a thorough understanding of sourcing challenges and that they continuously receive sourcing information. Against this background, iron and steelmaking firms need to recognize the importance of internal communication as a key activity in raw materials management. Within the benchmark price system for iron ore, short-term fluctuations of iron ore prices were non-existent as the iron ore price was negotiated and decided once a year. This enabled firms to plan ahead and rationalize their buying behavior. When the spot price-based pricing system was introduced 2008/2009 (UNCTAD 2012), the volatility of iron ore prices increased. However, with the new index platforms (such as Platts and Metal Bulletin),2 financial instruments such as futures and hedging were introduced by various exchanges. This gives the buyer/seller the option to mitigate the uncertainty of iron ore price fluctuations. Within RMM these types of financial instruments can play a crucial role in reducing unwanted uncertainty in relation to raw materials prices. An important aspect of RMM is the ability to develop capabilities that will allow the firm to deal more effectively with challenges related to raw materials. Such capabilities are important as they allow firms to develop process technologies that can better accommodate changes in raw materials quality. Firms also need R&D capabilities to continuously survey, cope with, and adapt to technological development external to the firm. Hence, R&D is important to proactively resolve internal challenges related to raw materials, as well as react to external changes. Research and development should therefore be used as an important element of RMM. Prior research has largely treated raw materials management from a functional perspective (e.g., as a procurement issue or one of technical manufacturing process development). Such research is clearly important and has contributed to firms’ ability to better deal with important areas related to raw materials as a key input to iron and steelmaking firms. However, even if this kind of research is important, we argue that many iron and steelmaking firms need to develop a more holistic approach to raw materials management. As a solution, we have proposed a more holistic view that considers both key external uncertainties and internal conditions related to raw materials management. In addition, our paper presents six organizational capabilities underpinning RMM proficiency. In so doing, this paper constitutes a starting point for iron and steelmaking firms that want to actively increase their understanding of raw materials risks, and also to mitigate these risks through a more active RMM. Basically, our approach is that RMM should be understood as a pattern in a stream of decisions that (a) guides the organization’s on-going alignment with its external environment and (b) shapes internal policies and procedures regarding how the firm handles raw materials. A first implication of our study is that iron and steelmaking firms should assess their need of a holistic approach to RMM. This can be done by mapping external uncertainties impacting the way they manage raw materials. If such uncertainties are significant, and if they have an impact on the performance of the firm, a holistic approach to RMM should be developed. The next step in the assessment of the situation of the firm should be based on an analysis of the internal conditions of the firm. Depending on these conditions and how able the firm is to mitigate external uncertainties, the need for a holistic approach might be further understood. If the assessment shows that a holistic approach to RMM is needed, this study can provide further guidance. Firms that aim to develop a broad approach to RMM should start with assessing how well developed their organizational capabilities underpinning RMM proficiency are. This study also contains a number of shortcomings. One is related to the fact that our approach can be viewed as an incomplete view of all aspects related to RMM, and it can be argued that its generic character ignores industry and environmental contingencies. We do, however, argue that our approach has important implications and that it constitutes a valid starting point for both firms aiming to increase their RMM proficiency and to future investigations into this important area for iron and steelmaking firms. A second shortcoming is related to one of our key assumptions. This assumption is that some firms do need a more holistic approach of RMM while others do not. While this study explores various ways of using a more holistic approach to RMM, the paper does not discuss in any detail when such a more complex RMM is needed. In a situation with few suppliers of a raw materials, the costs related to supply risks can be large enough to merit a holistic approach, or a more complex application of RMM. The tipping point, however, where costs increase enough to warrant a more elaborate RMM is not addressed explicitly. As this point is certainly of interest it should be the subject for further studies, together with investigations of the contingencies impacting the level of RMM needed and the related implications for how to manage raw materials in different situations.